After backpacking around the world for almost 3 years, in late 2003, I flew to Whistler in Canada to spend a winter season. I loved snowboarding but wanted to improve and while I had the opportunity decided to learn how to ski (assuming one day I would have kids, I wanted to be able to ski with them). The 5 months spent in Whistler was an experience to say the least, from having a house mate arrested and deported for an unprovoked physical assault, stupendous crashes on skis following the pros (apparently I’m 10% ability and 90% ignorance to danger) to such fun days and nights living for powder days, adrenaline and parties. During this time I had also broken up with my long-term girlfriend whom I’d been travelling with for 2 years prior, and towards the end of the season as people started leaving, it left me in something of a dilemma. I didn’t want to travel on my own without purpose, nor was I ready to go back to work. Fortunately, a phone call from Jon changed everything. My professional adventurer buddy Jon, from memory, had spent 5 months walking/rollerblading from West to East Australia and after settling back into his ‘home away from home’ Surf n Sun backpackers in Surfer Paradise, had met a Canadian girl. 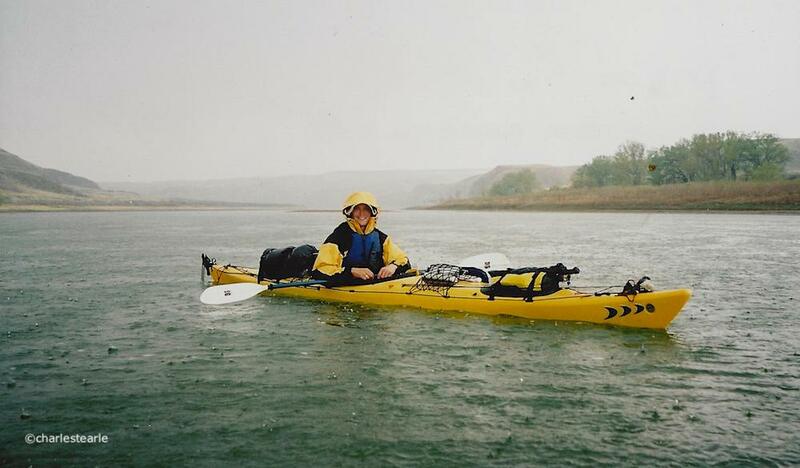 During the summer of 2003, before he departed for Aus, Jon and I had borrowed two beaten-up, hole-ridden kayaks and paddled down the River Exe in Devon for several days to see if a kayak adventure was theoretically possible. Previously while traveling in Thailand I had read and then posted to Jon the book ‘Paddle to the Amazon’ by Don Starkell, hence our inspiration. With this fun UK kayak trip still fresh in our minds, we agreed Jon would meet me in Vancouver, we would buy two kayaks and the remaining gear we needed locally, paddle across central Canada and he would then fly on to meet his girlfriend in Montreal. How hard could it be? I was in charge of the logistics. Due to the Rocky Mountains to the east of Vancouver my intend was to start at Lake Louise in Banff national Park, follow the Bow River, South Saskatchewan River, Tobin Lake to North Saskatchewan, through Cedar Lake to Grand Rapids and into Lake Winnipeg, then paddle up the Red River to finish in Winnipeg as this seemed the most realistic and doable option. Trying to confirm the route was actually possible wasn’t easy, or even possible. Everyone in BC I asked gave the same “why would you want to do that? Paddle around Victoria Island instead” response. Even when we finally put the kayaks into the water, and really up until we completed the trip, we had no idea if it was actually possible or not. To confirm our drop-in location was feasible I’d phoned the nearest club to Lake Louise, The Bow River Canoe Club, days before our departure asking about current conditions and they confirmed we could put in the water at their club if needed. I collected Jon, raced back to Whistler for last minute supplies including a large bag of the local medicinal pain relief and promptly went out for an epic farewell party, luckily some of my house friends were driving to Calgary early the following morning and offered us a ride. My memory is vague but at some insanely early hour recall Jon and I were dragged outside and stuffed into a car before promptly falling asleep again, hangovers should never get that bad. I recall, distinctly, the jubilation and excitement as we got closer to Lake Louise with everyone in the car immersing themselves in our adventure that would follow. When we arrived there was a lot more snow than Whistler, in Banff by comparison, everything was white, everything, and it was much colder. Cautiously walking towards the stunning Lake Louise setting my sense of dread increased, just as everyone else’s laugher exploded. Thinking at first it was an optical illusion, the lake was still frozen. As was the river I had planned we paddle down, as was the water right outside the Bow River Canoe Club. Jon’s sympathy to my planning error was naturally full of concern and reassurance…… We were doomed. All good adventures have set backs, albeit not many on day one, but it’s about finding solutions, not problems. Dropping us of in downtown Calgary, we said our goodbyes and rented our own SUV to commence shopping; two 17ft plastic kayaks, paddles, food, water purifier, cooker, pots, pans, sleeping bag, fishing rods, the list went on. Having decided we didn’t need GPS as we were following a river, we then needed maps. Explaining our route, the store keepers eyes lit up as he pulled out detailed map after map until about 15 were roughly pilled in front of us, and that was just the start. I should probably state at this point, Jon and I are both extremely cheap when it comes to non-essentials, like maps, and working out the cost we were both visibly sweating. Calming down by pacing the store Jon picked up a road map of central Canada and noticed most of the rivers we wanted to follow were shown, albeit very small, then seeing the price, we opted to buy just the road map. The next day, April 24, 2004, we unloaded the kayaks into the Bow River, dropped the car back and for the first time, tentatively sat in the kayaks to see if they would float. As we launched a nearby fisherman asked where we were heading ‘Winnipeg’ Jon replied; we could hear the fisherman still laughing as we paddled downstream. Those first days on the water were magical, we were frozen, almost literally, with ice blocks floating alongside us and the banks still covered in snow, but regardless Jon was able to catch several fish, the river was deep and fast flowing so we had dreams of fast paddling and fish for dinner the entire journey. Our first dam was an eye opener of what was to follow. Portaging 17ft kayaks carrying roughly a month in food and weighing around 100kg each isn’t easy, nor fun. Everything had to be unloaded and bags moved to the other side before we could manhandle the empty shells, often though pretty unforgiving terrain. Alas the problems didn’t end there. The water on the upper side of the dam has been quite deep and fast flowing with plenty of fish, however on the lower side, it was only inches deep. The weeks that followed were like a horror story unfolding, trying to find the right line though the shallows was the difference between lightly scraping the bottom but floating onwards and getting out to drag your kayak along, often getting back in when it was deeper for a few feet before being forced to exit and walk yet again. My feet were so soft from the damp I pulled a half inch long thorn from my toe I had no idea was in there until seeing a small black dot probably weeks after it entered. Insanity was only saved by our nightly routine of making camp, cooking, hot chocolate then enjoying the local BC pain relief while playing chess, often for hours, before sleeping to repeat the day all over again. A few weeks into the trip the physical side was already taking a toll, both our lower backs were in constant agony from the seats and our left hands, from movement on the paddle, had built significant calluses at the thumb to make them look distorted. The physical side was nothing in compassion to the weather though, the rain we could just paddle through (being British we were used to rain) but when the wind picked up it would almost drive us backwards even while paddling. When the wind picked up to a point we knew the day would be wasted, we we would usually wake, prepare the pain relief, and play chess. Now you might find this boring, but BC is famous for its pain relief and when combined with such a mental stimulant as chess, well, somehow, laughter ensued. Chess games would often last hours, yes, we were that bad. Then there was the time, after the wind finally relented and changed direction to being behind us, I had the brilliant idea of making a sort of spinnaker sail for the kayak, Jon agreed with my enthusiasm and only wished he had thought of it (for those reading who aren’t British, that’s sarcasm). Of course, using only apparatus at hand, not an hour later in increasingly strong winds, my makeshift ‘sail’ was in tatters, much to Jon’s laughter. Despite the occasional hardships Canada did teach us about human kindness, on many occasions we would strike up a random conversation or ask a simple favour, such as leaving our kayaks in a garden while we shop for food, only to be invited in for dinner and a spare bed for the night. After traveling the world, I’ve personally never experienced hospitality quite like the Canadians. And we hadn’t even reached Saskatoon. It would seem, if you’re two (relatively) fit Brits in Saskatoon and one of you wears a woven cowboy hat, fame isn’t far away. We were taken from bar to bar by the locals, playing pool, dancing (!) meeting others and finally, falling over. Like 4 years of college packed into a single night. The following day while walking down the street a random car pulled over to ask if we were the two kayaking Brits everyone was talking about? We had no idea who the guy was, nor who was apparently talking about us. But I look forward to returning one day to find out. The Canadians really are a breed apart and we would repeat the trip again tomorrow just for the people, or at least the chance to repeat a night in Saskatoon. This trip I discovered I have no talent for fishing and the entire time only caught one fish. We stopped at towns roughly every 3 weeks to restock food and take a shower, although when the weather improved and the days grew longer the river became our bathtub. As much as we welcomed the warm weather, it also brought the mosquitos. Hell has nothing on mosquitos. Eating while in a bug jacket became too frustrating as the seconds it took you to open and close the zip to eat the food, only invited the troublesome little fellas inside, and once in, food became a second thought. Building bug tents to eat was the only way but these weren’t always possible, and in the end when returning to our two man sleeping tent, even with a well practiced collaboration of one person waiting to enter while the other stood prepared on the tent zip, calling a 3,2,1, go, command to open and close the entry zip as fast as possible, this process then being repeated with one person inside the tent, still only served to reduce the number of mosquito that entered, rather than eradicate them. Each night was spent trying to squish the remaining pests, followed each morning by finishing off those we’d missed and had had their feed on us during the night. By the time we finished our journey, the inside of our tent looked like Freddy Kruger had been to visit. Bug jackets just didn’t work, sitting in our own little world with the mosquitos kept out was the only way. Of course stunning sunsets made his easier. Upon entering the lakes we discovered a new problem, the curvature of the earth. As we were so low on the water we simply couldn’t see the bank we were paddling too, and as our road map was so lacking in detail, we simply had to guess, or on one occasion climb a tree. Often the pre-dinner evenings were spent trying to work out where were and this would only really be confirmed when entering a lake or reaching a dam. I appreciate today everyone has google maps but in 2004, the iPhone hadn’t yet been invented. To give some context, Jon was jealous of me with my new (white, as it was only available in white a that time) iPod with some 20,000 songs while he had a portable cd player, with 2 cd’s. I did lend him my iPod, once, but after managing to make it ‘crash’ somehow within only a few minutes, that privilege was removed. Jon can live solo on a remote desert island for a month without a problem, but trust him with an iPod for a few hours…..
‘Yellow Submarine’ on Lake Winnipeg. My kayak was named such as when we started I had far more gear and thus it sat very low in the water. Jon’s kayak was named ‘Jenny’ from the movie Forrest Gump, unless speaking to his girlfriend Jenifer, in which case he says it was named after her. Lake Winnipeg also provided the opportunity to visit a cinema and upon leaving we were approached by an elderly couple asking what Brits were doing so far from home, explaining over a coffee, we discovered our new friend was a TV chef and he asked would we mind if he organised some press for us? Not seeing a downside we agreed. Shortly after we were interviewed for a local paper; little did we know that was just the beginning. Nearing Winnipeg on the last day we realised a problem, nowhere to camp. Finally seeing a small flat area suitable for the tent in someones riverside garden, we knocked on the door to ask permission to camp, an elderly lady (naturally) refused to open the door and asked us to wait in the garden for her husband to return. Shortly after a jovial and statuesque elderly man approached us calling out, “so you must be Charlie, and you’re Jon” Bewildered how he knew of us, it transpired the article Tony from Grand Rapids dam had written for the Hydrogram paper had just been published and as the house owner used to work for the water company, he still received a copy. Returning home after reading it and then being informed by his wife two Brit kayakers were in the garden, he put two and two together. Yet again we feasted on a fantastic home-cooked dinner and slept in a house. Who wouldn’t love Canadians? When you’re down-wind and on the water it’s amazing how close you can get to wild black-bears. In hindsight of course we were foolish to be so close in such shallow water, but in the moment, getting a photo took priority and the bear never knew we were there. On our last paddling day, July 29, 2004, as we approached our final destination and meeting to deliver the kayaks at 3pm, we counted the bridges to calculate our distance. Arriving promptly on time at the forks in Winnipeg, a crowd had gathered at the slipway and a local news crew present. Unsure at first they were there for us, our 10 minutes of fame were about to come and go. Shortly after completing the adventure Jon flew to Montreal to meet his girlfriend while I flew to Vancouver to reorganise my life and started emailing auction houses looking for work back in the watch industry. Returning to London, within a short time I had secured a job at Bonhams and moved into a wonderful flat just off Bond Street, after so many years away it was great to enjoy all London had to offer again. Late 2004. I recall this moment so well. Taken on a self-timer using a tripod, as I sat to ‘pose’ near the end of our adventure; at this exact moment I recalled just how uncertain my future was and what to do next. Little did I know the luck I would have in the years that followed. I’ll never forget those days on the water in Canada, particularly my mindset in the above picture taken near the end of our journey, as I recall not only the immense physical pain from hard paddling everyday for three months, but far worse the emotional struggle of having left someone I’d loved and not knowing where fate will take me, nor what will happen next in my life. Often now I think of those days when the unknown was so prevalent and remind myself, tomorrow is a new day and you never know what it will bring, just keep paddling though today and remain optimistic fate will allow you to prevail. Upon arriving in Winnipeg we managed to contact and meet the man that inspired our journey, Don Starkell (left, Jon, in staple cowboy hat, right) , author of ‘Paddle to the Amazon’ and ‘Paddle to the Arctic’. The kayak he used that day was the same one he used on his failed attempt to kayak the Northwest Passage that cost him several fingers to frostbite. Sadly, Don passed away in 2012, although his inspiration to others and spirit of adventure will live on forever.